Spice up your teaching and give your communication class something to talk about. Student engagement is key to teaching communication, and no one understands that better than teachers. For years, the National Communication Association and other conferences have invited instructors to share their ideas for classroom activities that drive home key concepts in a variety of communication courses. 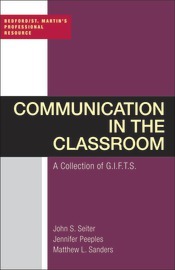 In Communication in the Classroom, editors, John Seiter, Jennifer Peebles, and Matthew Sanders, have collected and chosen the best 100+ of these Great Ideas for Teaching Students, or "GIFTS," in one book. All of these activities, for courses ranging from public speaking, interpersonal communication, and group communication, to mass communication, health communication, rhetoric, and more, have been submitted by real communication instructors who have tested and perfected them in real classrooms. Each activity includes a detailed explanation and debrief, drawing on the instructor's’ experiences. This is an invaluable resource for anyone teaching a communication course who is looking for new ideas to spice up their course and engage students.